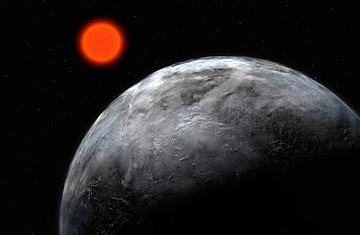 This artistic illustration released by the European Southern Observatory shows the planet Gliese 581 c orbiting the red dwarf star, Gliese 581. When astronomers discovered the first planet orbiting a distant star back in 1995, it took most of their colleagues completely by surprise. The detection, by European observers Michel Mayor and Didier Queloz, was indirect: they picked up the back-and-forth gravitational wobbles the planet imposed on the star 51 Pegasi as it orbited. It was a clever idea, but the wobbles"radial velocities" is the technical termwere so subtle that nobody had ever thought they could be seen. Since then, such radial-velocity searches have turned up literally hundreds of exoplanets. The latest and most dramatic of them was announced this week: Gliese 581g, a roughly Earthlike planet orbiting in the "Goldilocks" zonefar enough away from its home star that temperatures are not too hot, but close enough that they're not too cold either, and thus just right for the possibility of life. Powerful as the radial velocity strategy has turned out to be, however, it's got one significant drawback: because it's based on gravity alone, it can tell scientists only how massive a planet is, not how physically large. "If [Gliese 581g] is made of rock, it's probably about twice the diameter of Earth," says astronomer Steve Vogt of the University of California, Santa Cruz, the co-discoverer of the new world. "But if it's made of marshmallow cream and cherry nougat, it's a lot bigger." Vogt strongly suspects rock over nougat, but without an actual measurement, he can't say for certain. The planet could just as easily be mostly ice, or evena very long shotmostly gas. A way to determine a distant planet's size does exist, however: if it happens to pass right in front of its star, in what's known as a transit, the planet blocks some of the starlight (Gliese 581g, alas, doesn't do that). By measuring how much the star dims, astronomers can calculate exactly how large the blocking object is. That's the concept behind the Kepler Mission, a spacecraft launched last year into solar orbit to stare, unblinking and unceasingly, at about 130,000 stars to look for that telltale dimming. The probe's explicit mission is to find out how common Earth-mass planets are in the Milky Way, and last August the Kepler team scheduled a press conferencethen canceled it, announcing only that it had 400 "objects of interest" that it would be reporting on early in 2011. "The best thing I can tell you about Kepler," says Geoff Marcy, the Berkeley planet-hunter who has found more distant worlds than anyone else, "is that we sequestered 400 stars, and you can bet the implications of some of them are profound." Yet transit observations, in an inverse of the problem with radial-velocity measurements, can gauge a planet's size, but not its mass. That's why Marcy is working with the Kepler team, using the giant Keck telescope in Hawaii to help add radial velocity data to Kelper's transiting data. That gives you both size and mass and thus a much better idea of what the planets are made of. One giant planet studied this way and unveiled by the Kepler scientists last January has the approximate density of Styrofoam. Another, announced by Harvard astronomer David Charbonneau last December, has a density that suggests it could be more or less a gigantic blob of water. Charbonneau used Earth-bound telescopes to find that bizarre world, not Kepler. But while nobody is ready to spill the beans yet, it wouldn't be at all surprising if the Kepler team's announcements next winter include plenty of Earth-size planets, complete with information about their density and probable composition as well. The scientists still won't be able to detect life, though, if it exists, and that's always been the ultimate goal of most planet hunters. On Wednesday, Steve Vogt declared that he was "almost 100% sure" Gliese 581g has at least primitive organisms living on it, but that's an aspirational claim, not based on any evidence. To get the evidence, astronomers will have figure out what gases are swirling in its atmosphere, or how the surface reflects light from its starpotential clues to whether vegetation covers the ground or whether anything down there is breathing. That will have to wait for a new space telescope called the Terrestrial Planet Finder, capable of imaging a second Earth around an alien star. Unfortunately, the project was put on NASA's inactive list during a round of budget cuts a couple of years ago. Unless it's reactivated, the search for Earths will continue, and will inevitably succeedbut the search for extraterrestrial life on those new worlds will have to wait until someone's willing to pay for it.